short girl, long island. 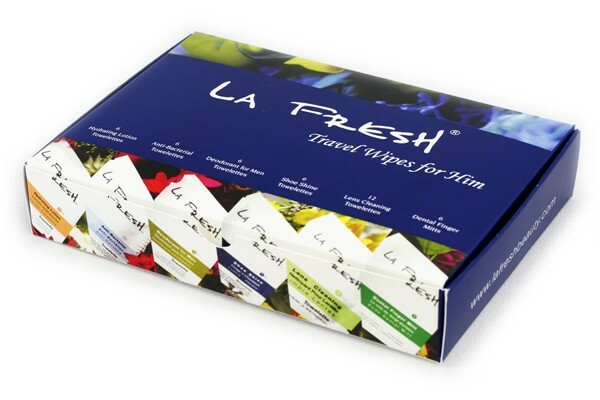 : LA Fresh Travel Lite Kits. Last month, I wrote about about my newfound love for LA Fresh's on-the-go beauty products. After I had tossed a few in my bag, I was talking to a friend's younger sibling about preparing to go away to college. I thought to myself, these packets would be perfect for students living in dorm quarters! LA Fresh's Travel Lite for Him and Her would be a perfect "in case of an emergency" kit for any student to keep stashed in their closet or under their bed, along with a plastic shower caddy, filled with full size LA Fresh products. When my friend Sean went away to college, he was constantly running out of grooming products, and would go days without hitting the store. Every time I would visit, I would do laundry for him, and go with him to the grocery store, to stock up on necessities. If these were around when we were working on our undergrad, you know what he would see under the Christmas tree each year! The Travel Lite for Him kit comes with various towelettes: Hydrating Lotion, Anti-Bacterial, Deodorant, Shoe Shine, Lens Cleaners and Minty Mitts. I tried out everything but the Shoe Shine. The lotion wipes are awesome - I thought they'd be gunky or gooey, but it went on smooth and moisturized my skin well. The deodorant wipe was kind of a bust - it lasted a few hours, but that was about it. The lens cleaners are probably one of my favorite LA Fresh products now, and the mint flavored mitt worked great after I had a vegetable hummus wrap for lunch. The Travel Lite for Her kit comes with an assortment of towelettes: Makeup Remover, Nail Polish Remover, Anti-Bacterial, Feminine Hygiene, Hydrating Lotion, and Lens Cleaners. In this kit, I tested out everything but the Feminine towelettes, solely based on the fact that they creeped me out. In my previous review, I covered the first three items, and the last two are the same ones I just spoke about in the kit for him. Overall, both LA Fresh kits make great gifts - not only for those going off to college, but for teachers, those who spend long hours at the office, or stashed somewhere in the house, ready for when you travel (or if you just run out of something and don't feel like heading to Walgreen's at 3am). Its also a great way to test out the line of LA Fresh products. I tossed a few of the lens cleaners in my glove box and plan on mailing a few down to my friend, Sean. He's no longer a messy college student, but he travels quite often for his job. These would be great for him to stash in his carry-on. Are there any on-the-go products or items that you can't live without? I love getting recommendations from my readers, either on the blog, Twitter, or Instagram [stellarmichele] - it gives me an excuse to try new things!